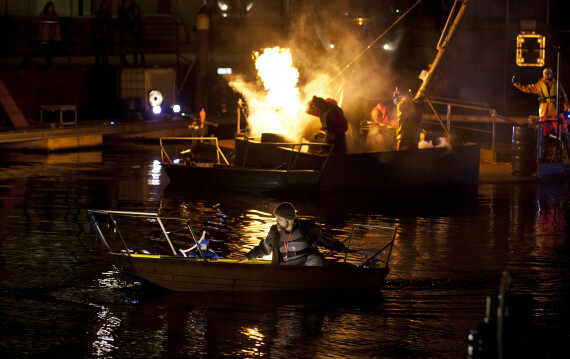 Founded in 2000 Slung Low is an award-winning theatre company specialising in making epic productions in non-theatre spaces, often with large community performance companies at their heart. Recent work – on an epic scale using cityscapes as backdrops - includes Mapping The City (with iMove Yorkshire Cultural Olympiad in Hull), Blood and Chocolate, (York Theatre Royal & Pilot Theatre), The White Whale (Leeds Inspired) and Camelot: The Shining City (Sheffield Theatres and Sheffield Peoples’ Theatre). In Autumn 2018 Slung Low launched a Cultural Community College based in Holbeck; a place where adults come to learn new cultural skills - from stargazing to South Indian cooking, from carpentry to singing in a choir – and all workshops, supported by Paul Hamlyn Foundation, are provided on a Pay What You Decide basis.